This is for my Wife. It is a good looking gun. Has a very good record. Gift for the girlfriend. Love my Walther P99c, hoping she'll love this just as much! Wife needs a new conceal carry; color matters to her, quality/reputation matters to me. Definitely worth the $$ & that color is beautiful! Was so impressed with everything about this gun! Took a bit getting use to the kick when firing it for the first time but overall I'm VERY PLEASED WITH MY 1ST HANDGUN & and the color to boot doesn't hurt..
Only thing bad I've got to say about it is how the empty shells eject, they kept hitting me in the head. Bought it for the wife. She loves it. Very reliable! The gun looks great. It is loud. Have to wear ear plugs to shoot it. Shoots well hasn’t jammed. Our friend had this gun in nickel / black and the wife shot it, easy to slide, fits her hand well so I bought it for her for her birthday, she has never owned a gun. She loves it. So far, no FTF or FTE on several different brands of ammo. Have not disassembled yet so I can't comment on the takedown tool. Wife Loves it, What else matter? Bought w/o firing, so was a bit skeptical. Range day was the test, and this firearm passed with flying colors. All 4 of us enjoyed the smooth operation, easy pull on the Slide, the ergonomic grip, and the .380 makes for quick follow-up shots. My only real complaint is the need of the required tool to break it down. If you lose it, you'll have to order another, and it's too long to fit in the back strap. I love this weapon very comfortable and light weight. Great little gun. Wife loves it, perfect. Interested in buying this gun. is it Egg Blue or Angel Blue? What happened to the Angel Blue one you had last week for 369.00? Did something get priced wrong? I thought It was this website. 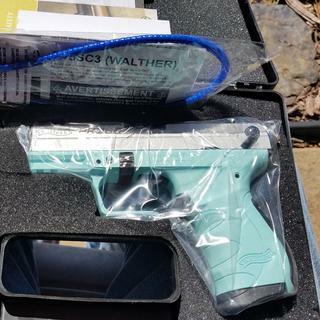 Walther PK380 Angel Blue. Bought this for my wife. Usually the Blue gripped PKs are more expensive as I paid total 471.00$ shipped but still worth the money. The trigger is light, the slide is light to rack and fires true. Only issue was an FTF with some junk ammo. The gun doesn't like MaxxTech. Hell, no gun likes that dirty ammo. Still it's a fine gun that's so easy to shoot and clean. Exception is it comes with a little plastic tear down tool instead of the regular pull down switch but no biggie. It's a pretty gun and my wife and I enjoy it very much.